Light, misty-drizzle this early Wednesday on California’s north coast, and with low clouds/fog, a much-wet environment. Warm air carries more moisture and with the heat, more rain/snow — as witnessed by California’s incredible drought-busting wet weather this year. 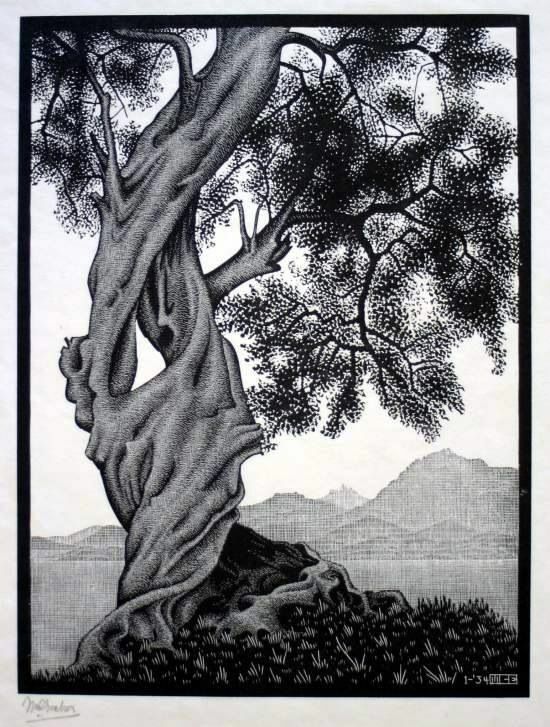 (Illustration: MC Escher’s engraving, ‘Old Oliver Tree,’ found here). And even to the point of being way-over it. Last year, the National Academies published a fat report on attributing extreme weather events to climate change. The report said that, although science can’t deliver an absolute verdict about what caused a specific heatwave or hurricane, it can tell us how much climate change boosted the likelihood or intensity of that event. In other words, science deals in probabilities, not absolute certainties. But as the science improves, with papers like this latest one, those probabilities get higher and higher. On Tuesday, the Mauna Loa Observatory recorded its first-ever carbon dioxide reading in excess of 410 parts per million (it was 410.28 ppm in case you want the full deal). Carbon dioxide hasn’t reached that height in millions of years. It’s a new atmosphere that humanity will have to contend with, one that’s trapping more heat and causing the climate to change at a quickening rate. In what’s become a spring tradition like Passover and Easter, carbon dioxide has set a record high each year since measurements began. It stood at 280 ppm when record keeping began at Mauna Loa in 1958. In 2013, it passed 400 ppm. Just four years later, the 400 ppm mark is no longer a novelty. “Its pretty depressing that it’s only a couple of years since the 400 ppm milestone was toppled,” Gavin Foster, a paleoclimate researcher at the University of Southampton told Climate Central last month. President Donald Trump‘s planned climate change policies could lead to an extra half a billion tons of greenhouse gases in the atmosphere by 2025, according to a new analysis. That is equal to the annual electricity emissions of 60 percent of U.S. homes. “We found that the ‘Trump Effect’ really begins to bite into the U.S. emissions trajectory in 2025 — since many of the factors influencing today’s emissions trajectory can’t be reversed quickly,” the report said. Currently, six states have legislative measures pending or already on the books that would allow anti-science rhetoric, including the rejection of global warming, to seep its way into schools’ curricula. While these types of proposals have become fairly routine in certain states, some of the most recent crop have advanced farther than in the past. These old proposals are being made new again along with a stark ideological switch at the federal level. The EPA administrator doesn’t believe carbon dioxide contributes to global warming. And the White House’s continued rollback of environmental regulations reflects those viewpoints. In fact, a series of Pew studies shows 2016 marked the largest gap yet between Republicans and Democrats over belief in human-caused global warming.